We issued an updated research report on energy provider, Consolidated Edison, Inc. ED, also known as ConEd, on May 18. ConEd follows a systematic capital investment plan for infrastructure development and expansion of renewable assets. Going ahead, the company boasts a robust capital expenditure plan of around $11.1 billion for the 2017–2019 time frame. Roughly 84% of the planned investment has been allocated for its regulated utility operations, while the rest goes to its competitive business. With respect to recent updates regarding its renewable assets generation, the company’s renewable energy production volumes improved a solid 34.4% during the first quarter of 2017, leading to an increase of $20 million in renewable revenues. The company plans to make renewable investments worth $450 million in 2017 and a total of $1,250 million in the 2017–2019 time frame. Moreover, on Jan 19, 2017, the company increased its quarterly dividend payout to 69 cents from the prior distribution of 67 cents. In this line, ConEd’s stock gained 11.2% in the last one year, outperforming the Zacks categorized Utility-Electric Power industry’s gain of 1.4%. Further, ConEd’s net cash flow from operating activity in the first quarter was $448 million, while its cash and temporary cash investments were $67 million compared with the prior period’s $61 million. This demonstrated the stable financial position that the company boasts, backed by a strong cash generation capacity that enables it to follow a disciplined capital spending program. ConEd’s first-quarter earnings as well as revenues comfortably surpassed the respective Zacks Consensus Estimate. Results also improved year over year. However, the company faces intense competition from other utilities in the market like Alliant Energy Corporation LNT, CenterPoint Energy, Inc. CNP and NiSource, Inc. NI, all of which belong to the same industry. 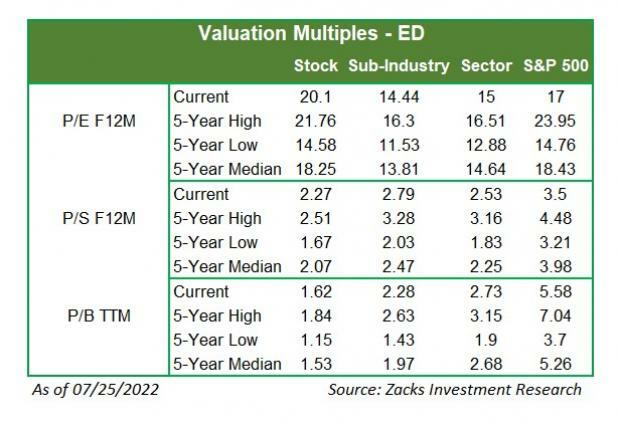 Consolidate Edison currently carries a Zacks Rank #2 (Buy). You can see the complete list of today’s Zacks #1 Rank (Strong Buy) stocks here. Starting now, for the next month, I invite you to follow all Zacks' private buys and sells in real time from value to momentum…from stocks under $10 to ETF to option movers…from insider trades to companies that are about to report positive earnings surprises (we've called them with 80%+ accuracy). You can even look inside portfolios so exclusive that they are normally closed to new investors.